What a day that was in my childhood! was so howling and so loud and strong. covering doors and windows on most homes! checking on folks - especially the elderly. though. So many go to warmer places for those cold months! All services stopped - electricity and certainly telephones. Everything but our survival ceased. our den (smallest room in our large home) to try and keep warm. I remember we played a lot of games during this black-out. I remember my father and mother very worried about my older siblings who had already left home and were in college. lost well over a month of school. Which was fun to us kids, of course. 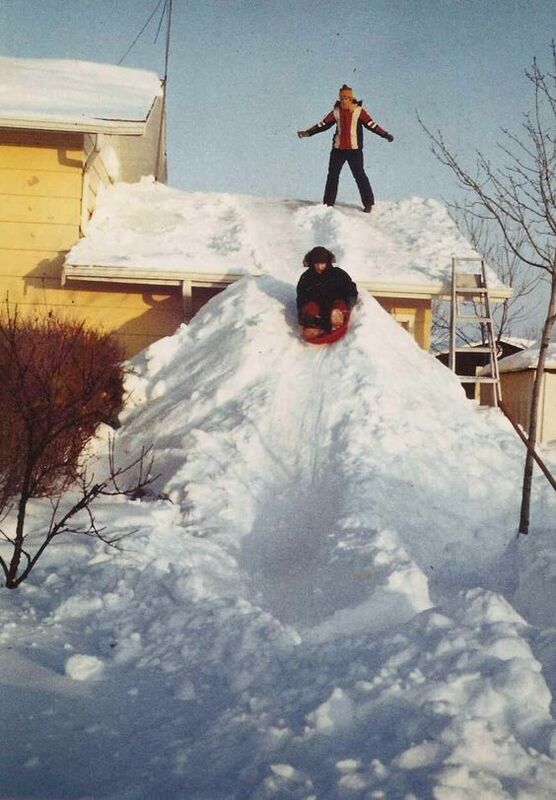 and slide off the roof onto the snow just like these kids are doing. I remember my little brother and a neighbor friend made the best igloo and it didn't melt for months! It was so solid (they wet it down with water to turn it into ice) and it so cold outside they could even have a little fire going inside it! I think my brother made it because he was going crazy stuck in the house with his two sisters! I remember not really being invited in to play in that igloo, but that's ok. After all, I was a teen by then and didn't play much, heh heh. who didn't have snow removal services. 70 lives were claimed due to this storm, 51 of them Ohioans. That's not all that perished. Much wildlife died. I remember seeing so many frozen birds, it was awful. The Berwick's wren, which was on the decline, was virtually eradicated by the storm, said Jim McCormac, avian education specialist in the Ohio Department of Natural Resources Division of Wildlife. The Carolina wren and the northern mockingbird have bounced back since nearly being wiped out, he said. The bobwhite quail, which is most comfortable in an open field and some brush, has faced a tougher recovery. Its numbers have failed to reach pre-blizzard levels. Ohio is trying to help by resettling quail from Kansas on reclaimed strip mine land. This type of rapid deepening is known as "bombogenesis" and is usually reserved for strong hurricanes. The storm is also referred to as the "Cleveland Super-bomb". This unforgettable storm was really something to experience! just exactly how major this storm really was. I encourage everyone to look up this amazing storm. about it from all over the North East and snow belt! and if you were impacted by this storm, too. I was a newly-wed, having just got married in Sept 1977, and living with my new hubby in apartment in Brunswick Ohio when the Blizzard of '78 hit. Being the work-a-holic I am and was even then, I insisted my hubby try to take me to work that 1st morning! Needless to say, we didn't get too far and then luckily got home in time before everything completely snowed in. We ended up stuck in our 3rd floor apartment for a week. Hubby walked down the road 3rd day to 'corner' store and was able to get a few supplies surprisingly. He looked like the abominable snowman when he returned. Oh yes, I remember this storm!!! Yikes!! I remember having snowbanks almost equally as high when I was a kid and living on the banks of the St Lawrence River in Quebec, but that was normal for us so we were all prepared for it. It must have been absolutely horrendous to live though. 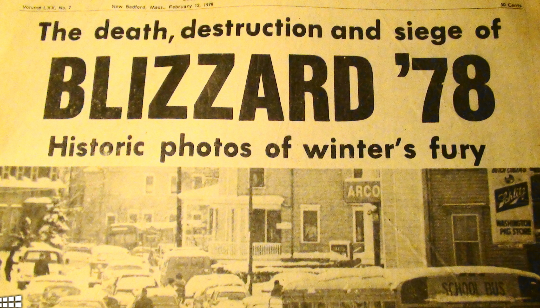 I remember this blizzard. I was just a few years out of high school. Glad you survived and could make some fun out of this. It is amazing all the pictures. I think I remember this. I lived in Michigan, on the thumb. We lost power. My parents called it the ice storm. Fortunately, we had a fireplace to huddle around, but at sime point we decided to head for my grandparents house because they had power. We must have had working phone lines to know that. My Dad's car was parked at the road and we had a long driveway to reach it. I think he parked out there because he could not get into the driveway. So we trudged out. When we were about to go under the few power lines that were still hanging my Mom made us run. We knew enough not to touch the ones that were already on the ground. Grandma and grandpa had power. It seems like we were only there for a short time. We came home. Everything melted. It was okay. 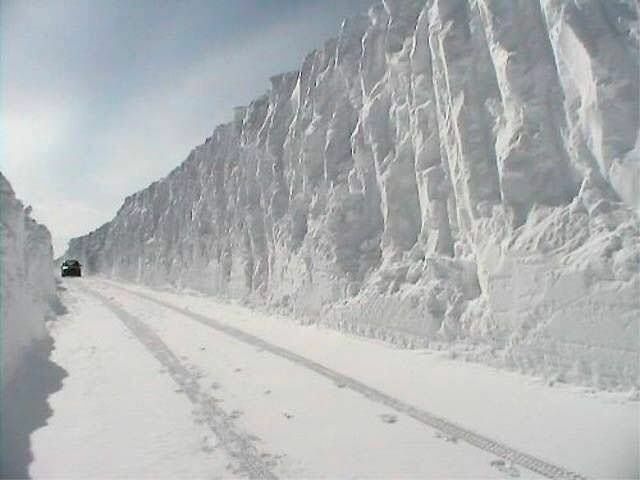 Now that's a lot of snow. We had an ice storm here, all the trees were covered with ice. Hope you have a better winter this year, Michele! Don't want another snow storm like that here. We are having a mild winter seems like. Oh my gosh, I sure do remember this, Michelle! I was 20 and living in Cleveland. Couldn't go to work for 3 days, because no one was allowed to go anywhere! We didn't lose power (amazingly), and were able to watch most of what was happening on television, although all we had to do was look out the window - lol! This is so much like the winter's here in the seventies too Michel. The banks along our roads look like the ones you shared here. It was because of the wind that we would get every winter. We are having quite winter here this year, but thankfully minus the wind (so far). It's blown only about 2 days but the banks are still over eight feet in some of the north-south roads. It's crazy, but I am sure loving all this snow. I loved every photo of your past winters! Wow, that's a lot of snow. I don't remember even hearing about the storm but then I was a young mother with a 3 and 4 year old so I was busy! What an amazing storm! I would have been 19 years old then and heard of it on the news, but that was all. My husband, who's Canadian said he doesn't remember that storm and said Ontario may not have gotten much snow from that storm. I'll have to Google this and find out more information and see the photos. Thanks for sharing with us,I really enjoyed reading about this storm. I was living in Arizona that year so missed out on the "fun." Thank goodness. I will have to research and see if it was an event in Maine or just for you folks struggling with lake-effect snows. My mother told me when she was a kid in middle Maine (45th parallel) that the snowstorms were so massive that crews would come around to dig her father out of his home. He was a railroad engineer and that train had to run. Sometimes, when truly desperate, he would exit his home from the second story bedroom windows. This would have been in the 1940s. Personally, those days need never return. Fun post, Michele! I can't imagine all the concerns your parents would have had. I remember it, Michele! I had two kids at the time, and luckily we had a wood burning stove inserted into our fireplace, and I had a gas stove. We lived in Grandview, and there was ice everywhere! Oh, the memories you've reminded me of. I remember that storm. Michele. We were in WI at that time and also had snow but not on the level of what you had there. When I was a little kid we had a storm like that in 1958 and we were stuck on the farm for 14 days before a single plow came through. We had to milk the cows by hand and take the milk out back and dump it because there was no way to keep it. We did have a wood furnace and a wood cook stove in the kitchen so at least we were warm. I can remember not being able to see out the front windows though because the snow was up to the eaves. Our kids don't really understand what it was like back then-even machinery wise we didn't have what they have now. ps- My brother also built one of those igloos and wet it so it turned into ice-he had a little fire pit in there and a cot and reading materials..lol I was forbidden to enter. Now you know why I left Ohio. I was gone by then and living in Sunny CA. But, I do remember in 1950 9think that the right year) we had a terrible snow storm around Thanksgiving and were sowed in. We lived about 15 miles from Lake Erie and the snow effect was terrible as we lived on a farm in Jefferson, Ohio and were snow bound for many days. It tool my father over 12 hours to shovel a path to the barn to milk the cows. They were yelling to be milked. Thanks so much for this very interesting post. It sure brings back many memories that somehow were almost forgotten about. Stay warm and I sure hope your not having that bad of a winter now. Michele, this storm is unbelievable...I don't remember this at all. The photos are amazing. I am going to look this . I live in Alabama and in 1993, we had a blizzard of my lifetime in the South! Thanks for sharing this interesting weather phenomenon! Nice post Michele. 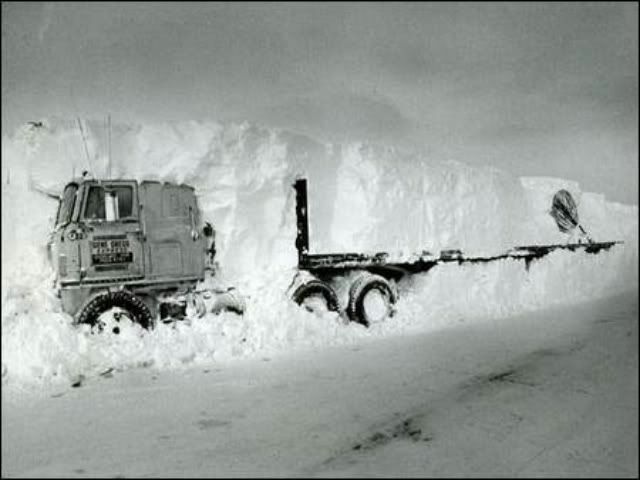 Amazing pics from the snowstorm of 78. Looks like you did have some fun in the deep snow. Glad to read the Carolina Wren is thriving. We don't have near the quail as when I was a young girl. I remember my dad going quail hunting then my mom making quail pie. It was like a pop pie and she made a thin gravy to go on top. We loved it!! Also nice winter header on your blog. My husband and I were students at MSU, not married yet, but we lived on different floors in the same dorm. He was an RA on the "nerd" floor, and they had planned a party that no one was coming to! Well, that snowstorm hit, and everyone came! There was nothing else to do, and no way to go anywhere. All I remember about that snowstorm was that the hall was packed with party-ers, and some brave souls trekked out through the snow to get more kegs of beer! Those nerdy guys were suddenly very popular!! Oh my goodness, Michele!! I don't think I've ever seen so much snow in my life, and I'm from Canada! The two pics of the house and cars is unbelievable...and scary! So glad you and your family were safe. It's always so tragic to hear of those who succumbed to such a terrible, natural disaster.